purplegirl & beerman: Day 18… On the bus again…. Aaarrrghhhh! 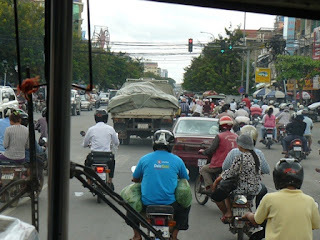 We had half a day in PP before the bus trip to Kampot so we headed for the Central market. A couple of singlets (buying saves washing – he he) some shorts, and a re-stock of shampoo, toothpaste etc. Back to Blue Lime to check out and wait for the bus pick-up. Bus arrived, we loaded and surprise, surprise we left only about 10 minutes after the scheduled time. That was the ONLY good thing about this bus trip. About a dozen tourists and maybe the same locals when we left the bus station. Half empty bus means stopping and picking up en-route. 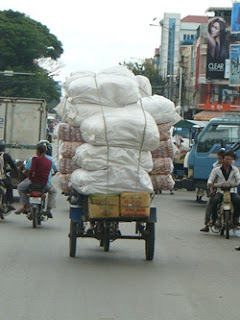 Phnom Penh traffic is pretty manic - not as bad as Ho Chi Minh City but some of the things you see leave you wondering just .... how? So we stopped, and we stopped, and we took what appeared to be the back roads, and we stopped to pick up an old ladies bag of vegies, and we stopped for some bloke to have a pee, and we stopped for someone to get off, and we stopped to deliver a parcel, and we stopped for someone to get on. And on it went! Add to all this a horn happy driver – how often do you have to blast your horn for the moto you’re are going to pass to realise there is a bus coming – 7 or 8 times at least… starting 50yards before you draw level and one final one as you leave the poor person in your wake! And we stopped again, to deliver the old ladies vegies, and for someone else to have a pee. The westerners got their comfort stop. And we stopped again, and again and again – and while all this was happening we were being tortured with more episodes of Khmer stand up comedy and Karaoke. Last year when we got the bus back from Kep it took about 3 hours, this time it was closer to 5. When the girls were little we had a saying – “you need a milkshake” – meaning someone was tired and cranky and needed some fast acting food to make them a nice person again. I can tell you, I needed a milkshake by the time we arrived, and we were yet to face the tuk tuk driver scrum that greets every western traveller at every bus station in Cambodia. So now you know why I added the Aaaarrghhhhh! ..in the title line of this post. We got the bag and headed away from the mele for a ciggie. A pommie bloke we’d met on the bus joined us and the three of us just stood and had our smoke. The drivers finally got the message that they just needed to wait quietly, and that jumping in our faces would have a negative outcome for them. Picked our driver, negotiated a price ($3 to drop us at Mea Culpa and the pommie guy at his g/h. The other drivers were none too happy. Arrived at Mea Cupla, complimentary coffee, check in and by now it was about 5.45pm and we couldn’t muster the energy to go out in search of dinner so we stayed here and had pizza. Ben the Irish owner has a wood fired pizza oven – and it makes the best pizzas I’ve eaten in a long time. They bake their own bread too. 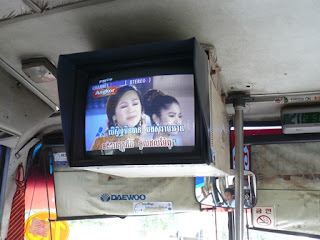 Thankfully we have a week before having to endure the Sorya bus again.